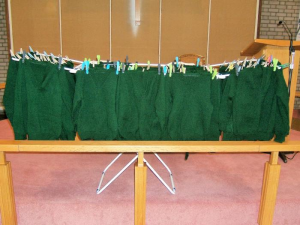 On Sunday 19 November 2017, there were 57 green jumpers displayed at the front of Wimborne Methodist Church. All had been knitted by members of the congregation and will be winging their way to Zambia for the children of the Future Pillars School. had a few more knitted in Cornwall too…. anyone know any schools with green uniforms particularly Secondary?